Freeze four balls near the right side with the 1 ball sitting right in the pocket. 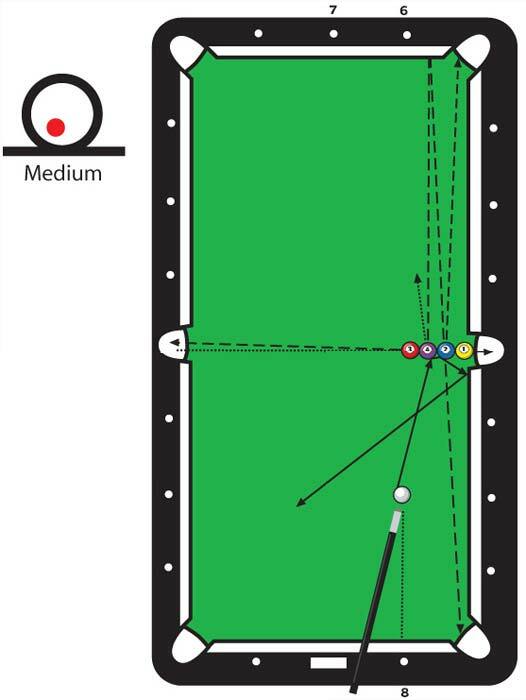 The four balls should be in a direct line with the side pockets and in the sequence shown. Position the cue ball at the head string in line with diamond no.8. Hit the cue ball with a little bottom left, aiming the 4 ball between diamonds no. 6 and no. 7. Hit the 4 ball first. The cue ball imparts right english on the 4 and banks it into the corner pocket. If the 4 ball is englished too much, move the cue ball more to the left.